The answer to the question: "Where are pearls found?" may surprise you. Pearls can be found in the most unlikely places. Last November I attended the Pearls Exhibition in Tokyo. On one large wall, as part of the exhibition were several types of "shell" creatures mounted and their side was the pearl they produced. 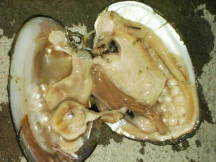 You can imagine my shock when I saw a common sand snail with a "pearl" it had created inside of it. But, just because all sorts of "shell" creatures can produce something like a pearl, doesn't mean they all have value or worth. Some are more accurately called calcareous concretions. When considering pearls of value and worth, here is a list of countries and regions that answers the question: "Where are pearls found?" This is from the GIA education department. So...where are pearls found? Many, many places...however, this is not a comprehensive list for the places where natural pearls have been found or are still being found today. Historical records, for example, site several places in the USA alone where natural pearls have been discovered. Find Australian pearling history here. Scotland is another place where many natural pearls have been found. In the 1930's Venezuela was a popular place to find pearls. October, 2007, US Jewelers are urging a ban on Burmese gems. Where are Pearls Found? Natural ones, that is. An excellent overview. New Zealand Where are pearls found? Where are Calcareous Concretions Found?